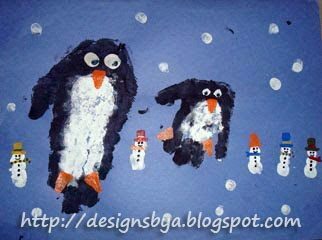 To make the handprint penguin: paint a white tummy coming down to the knuckle on the 2 middle fingers, then paint black in the remaining areas making sure not to forget making a ½ circle for the head. With all the fingers in a closed position, firmly press the hand flat on the paper gently rocking it sideways a few times. To make the eyes, paint a thumb white & gently press (you may also choose to use googly eyes. When the paint dries, paint on orange feet and beak (you can also use construction paper. Add a black dot to each eye. To make the fingerprint snowman: Use a white thumbprint for the bottom circle, an index finger for the middle, & a pinky finger for the head. Decorate the snowman when they dry. To make the fingerprint snowflakes: Use the pinky, index, and thumb to create different size snowflakes. Suggestion: add silver glitter to the snowflakes to make them sparkle.